What's new in my pages? Updated the robots section again with a few more toys. See them in the robot toys page as predictable. Added 2 maps to the Arcade maps page : Galivan and Kiki Kaikai levels one. > > Wednesday, September 14th, 2011 - Not quite inactive! Well well, what's happening here? Would that be an update, after over 1.5 year? Yes indeed, it is an update! This would be a quick one, tho, but i wanted to tell about a few new purchases, some of which fall into my robots collection, and some others will join my pocket computers collection. As for pocket computers, i've bought two recent machines that's i'm actually using and which match my interest in "historical" pieces of hardware. The first one is an Apple Ipad... For quite some time now, i am sorry to realize that it would be almost impossible for me now to get my hand on a first generation iPhone or first generation iPod. It's clear today that these machines changed the handheld market *a lot*, but at the time, i couldn'nt afford one or, in the iPod's case, i was not that much excited about them. Recently, with the iPad 2 coming to the market, i was lucky enough to catch a low-price iPad one... Seeing how the tablet market is shaping these days, no doubt this apple Device once again changed the rules. So i'm happy to have a version 1 in my collection! Next neat purchase : i've bought an ASUS eee Note! This little machine is, litterally, a digital notebook. With it's grey-levels LCD display and his sensitive screen using a Wacom Stylus for input, this machine is very far from today's standards in tablets. But on the other hand, it's very good at what it does, that is note taking and accessory tasks (like doodling written notes over e-books...). I've used several graphic capable senstive screen devices in the past, but this one is the closest to being my dream machine. So these two devices will be listed in my collection starting today; and of course, i plan to create dedicated pages for each "some day"! Then, about robots, here come two other new devices! I've hesitated before mentionning, but i think they belong to my robot collection. The first one is, much like the eee note, a dream come true : it's a very affordable robot-arm. The second one is a toy, coming straight from the 70's in a downsized and slightly upgraded version : the Bigtrak "programmable" tank. Although these machines are both very simple in design, they do qualify as robots, at least robot enough to feature in my collection! I hope i'll be able to update my pages soon and add these, along with a few pictures and text description. So, if i do... then who knows? Maybe i'll post another update in less than 1,5 year! > > Friday, Junuary 1st, 2010 - Happy new year everyone! 2009 has passed without a post from me in my site. I didn't actually pay attention to that, but discovering this feels a little sad. So what was i up to, one might wonder? Well, a lot, actually. First off, i've been into digital photography a lot. Graphic design has always been one of my major interest, and i had left it apart for several years, so eventually the backfire hit me really strong and i'm actually putting all of my free time into developping this "not so new" activity of mine. "Not so new" i say... back in the late 80's and early 90's, i used to work on this kind of pictures. Today, i'm putting these new tools that are digital photography and digital editing to the same kind of use. And i find myself spending dozens of hours working on each pictures, just like i used to back then. I would like to create new sites dedicated to these images, but i also miss time to do so. Along with developping this activity, i've also left apart many of my other hobbies. Also, when moving away from Paris, most of my collections were packed into boxes and never left them since then. I have not been completely idle on the collecting side, tho... I only didn't take the time to take pictures and update my site (although i'm aware of many things that ought to be, not even mentionning news updates). In 2009, several purchases came enhance my robots toys collection. I've also passed on some other planned purchases for it, like "real" robots (motorized toys for instance) mostly because i knew i would have missed time to use/test them and they would have ended up sleeping in boxes or on shelves. So instead of buying functionnal items just for display, i've bought no more than simple toys to display on my shelves. As for pocket computers, no acquisition at all in 2009 for my collection... There are still a few items that i'm after, but they're either rare, or expensive. Some of these items would be a first generation iPod and a first generation iPhone, both of which are absolutely impossible to find nowadays. Other interesting items would be an original Psion Netbook, or in my wildest dreams a Palm Foleo. Speaking of the iPhone, i've not fallen for it yet. For several reasons, i've long kept my now 6 years old phone and was perfectly happy with it. I thought i had lost my geek mojo... But 2009 brought interesting new products to the smartphone market, and at the end of the year, i knew which one i'd go for! Since yesterday, i'm the proud owner of a Linux smartphone from Nokia! Anyway, I won't make any new year resolution. I only wish i will be able to share more news and information on this site than last year. We'll see that! And I wish you a very good year, thank you for reading this, for visiting the site, and i'm looking forward to the contacts and exchanges my site will bring this new year. As i mentionned in my previous entry, i was waiting for a "surprise device" to get to me. Absolutely uninspiring to most, i guess, here's the device revealed, on the right! It is a Casio PA-100, a machine that i thought i'd never find. One of the last ones of that breed, too... Thanks to the internet, and to some precious help (Hey Niclas, still around?! ), a few years ago i've identifying (and, for some, acquiring) a few machines that were absolute never-to-be-found graals to me. The PA-100 is one of these. So, i've written a short presentation page for the machine, although i still don't know much about it. In the same buying craze, i've also acquired an Asus eeePC. As i expected, i've started using it as some sort of PDA, mostly to surf the web for now, but i'm expecting more once i've played with the OS a bit, installed a few new tools, and, most likely, added a memory card. I've also listed the eeePC in my collection, although i haven't created a page for it yet. For many reasons, it fully deserves it's place here. To name just a few : it pionneered the low-cost ultraportable trend (followed by many), it created a new market for simple to use, proprietary OSes devices, and simply revived the "pocket computers" world, although it's way larger than most machines in my collection. I was also watching the evolution of both PDAs and ultraportables, still thinking that there were two worlds out there and wondering when the two would actually meet. In my mind it's now official with the eee's and alike. Same motherboard, same uses, your choice of a simple dedicated OS or a regular PC OS : again, despite it's large size, and maybe due to it's marketing positionning, i do feel that the eee does belong to both worlds. I think i still need a little time to work on a decent presentation page (meaning both that i need to think of it AND find time to actually write it!). Still, i give a warm welcome to this new member in my collection! Hey everyone... well it's been half a year since my latest post on this site. I must confess that i've been posting on other sites, tho, but my collections have been sleeping for all this time. Things change those days, as i will soon add a few new items to my pocket computers collection and to my robots collection! To begin with the robots : i'm still hoping to buy a Tomy-Takara Omnibot robot this year, which would join my "real robots" group in my robots collection. 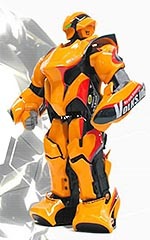 However, i still haven't bought one, so the new acquisition i'll receive in the coming weeks are just toy robots. Three of them. Nothing actually worth mentionning at the moment, but i hope i'll be able to update my robots collection page some day soon and add them. The EEE PC 900, from Asus, was launched recently, so the previous models can now be found at even cheaper prices than usual. When it was first announced, i saw the EEE PC more or less as the revival of a long extinct breed : full featured keyboard enabled pocket computers running proprietary OSes, like the Sharp Iq-9200, the Psion Series 5 or such machines that were, at the time, presented as PDAs. The EEE-PC, running a special linux version, follows the same trend; even if it's significantly larger and borrows much more from the laptop world than from PDAs. Just like i initially bought a Sharp IQ-9200 as a PDA i would use everyday; before i stopped using it and it became part of my collection, today i've just ordered a low-cost EEE PC 701, which -i think- will have about the same kind of life! I'm expecting to actually use it, as a notebook and as a web browser mostly. In any case, it will ultimately join my collection, as i think it had an interesting impact on the ultra portable world and thus deserves it's place aside some pionneering machines i own. I'm also waiting for another machine to get to me! This is a pure collectible, obscure item, and, also said to be not working; i'm very excited about it. I first heard about it in Eiji Kako's now defunct online museum, but there was no information provided about what it was, and what it was intended for. Today, thanks to the internet and years of patience (or, to say it honestly, i just quit searching for one many years ago!! ), i've bid on one and i'm now waiting for it to take of from Japan and safely land here! So... If i don't turn back to other hobbies until then, new updates can be expected in the weeks to come! i still allow me a few days before i switch to "project management" mode and start getting involved in the moving. There will be a lot to do. I also think this should not mean much of a change regarding my site. Maybe (i said *maybe*!) the change of life will leave me with enough free time to update the site more often, but i doubt it for now. Time will tell! Now, second event : my site will "officially" turn 10 year old this year!! Since it was created, the site has been hosted at 3 different places, starting as a sub-section of a friend's personal site. It had 4 different graphic designs, including a few years when every section had a completely different design each, while the current design and unified layout dates back 2003. Wanna see what it was like since 2001? check this link Only the versions hosted at the current address are available there, and i can't find the ealier designs on any of my computers, so i think it is still somewhere on one of my old computers; i'll try and find it whenever i can. The contents also evolved : while the first version was already a mix between my graphic work and other topics i was interested in, my collections only appeared in version 2, at first as pure HTML pages, next as PHP, yet i still don't use a database. PHP allowed my to make the site management a little simpler, as i've also developped a few very simple tools for that purposer (like the very basic weblog function i'm using right now to type this update!). Now there are still a lot of things i'd love to add/change/update. I have already begun working on new contents, mostly in french but i also have ideas for new contents or sections in english. From the site, i also for a few commissionned works, as well as some new friends all around the world! Anyway, for this 10 year anniversary, my thanks go to everyone that visited the site, found information there, contacted me to discuss the topics i present. These are the very reason why this site exists! Thank you everyone, and a happy new year 2008! Once again, i've waited *ages* before posting an update, despite the fact that during the time, i came across many interesting news. Rumour has it that Sony could revive the Aibo! Read that here with a picture of what could be the robot's new design. The rumour says that the new Aibo would be marketted as a companion to the PlayStation systems. Maybe just what i'd need to find the PSP attractive! Toyota presented their new robots recently in Japan. All the news in pictures in this page. I keep thinking that their design is just, well, moderately appealing, yet this presentation is quite interesting. The i-Sobot, from Tomy-Takara was finally released in Japan last month! Available from Amazon Japan for approx 28000 yen, the little buddy is fun and appealing, but i think i'll wait for the next version, to be released in 2008, that should embed a digital camera a wireless connectivity. Amazon Japan also has a book about the i-sobot family, which dates back to the 80's with several more or less advanced robotic toys. I came across this video presenting a project from the Computational Neuroscience Laboratories in Japan (although it was presented as american in the source where i found the link -sorry i lost that source...-). The project is about preserving balance on a humanoid platform subjected to random external forces. Interesting to watch! I've already mentionned several small-sized humanoid plateform for the hobbyist, all of which were "cheap" as in 1000 EURO or so. There's a new one in town : the Robophilo. Available for $500, the machine is programmable and seems pretty complete. It is capable of a wide variety of movement, including walking, but browsing for videos, advanced movements (typically walking) look pretty unatural and cheap. The machine also lacks built in sensors (like a gyroscope, at least) that would make it much more interesting to program. On the other hand, it is affordable enough to consider adding DIY sensors to the base package, i guess. Today arrived my second new machine this year, and as i had time to snap a quick shot of it, i also seize the opportunity to talk about the previous machine i also received this year. The Sony PDF-5 (2 top images). With this "PDF" name, you might think the machine has something to do with digital documents, and you would be right! So, what would that be? According to Sony, it's a machine that one would carry all their useful and important document in digital form in. Have an important document printed on paper? Just use the PDF-5 included scanner (lower part of the machine) to put the document "in" the device. I have not tested the device yet, but i like the concept. Sony has been interested in e-books forever, and the machine almost seems to be some kind of R&D product brought to the market. It is a rather big machine, i've put a smaller picture with a CD (please notice the machine has no CD drive) to see the size. The other machine is a FX-801P from Casio. This machine is one of kind, as it's the only pocket computer Casio ever released with an integrated printer and tape recorder. 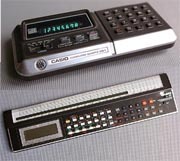 There has been other Casio pocket computers with built-in printers, there has also been "cradles" providing printers and tape recorders extensions to simpler Casio pocket computers like the PB-700, but, apart from this one here, Casio never any other all-in-one machine. The FX-801P is also particular in the Casio lineup due to it's design and color, different to any other. Many reasons why i had to grab this one when i found it! It's been over 3 months of lazyness since my latest entry... i've attempted maybe a dozen times to write something, only to cancel the attempts after just 2 or 3 lines. Today i'll take a different approach : here's a quick unsorted list of topics and facts i wanted to talk about. Maybe i'll overcome lazyness some day, and take some time to write more later. One can read a lot about "pocket computers" in the news lately... Be it about the OLPC, the ASUS EEE, Palm cancelling the Foleo, or the new PDA-Like Ipod-touch from Apple... In a few forums about these new lighweight, small-sized, and mostly *cheaper* devices, i've seen several people talk about the "good'ol days" when they had a Psion/Omnigo/(You name it...). I must confess that those new, cheap devices, if not available yet, appear full of promises. I would definitely consider buying a -$200 device with the ability to boot quickly, run for at least a normal day of use over a battery charge, surf the web over Wifi. This was actually some of the reasons why i've bought a Nintendo DS in the first place. Now, if the machine could also offer a keyboard and (but maybe i'm asking too much) an included programming language, then it would be very close to my dream machine. Much closer to something i could afford, the small humanoid robot from Tomy-Takara should be released next october. I don't know if i'm still as interested in it as before, but let's face it : it has entered the Guiness book of records as the smallest humanoid robot in the world, and it will cost less than EUR300, so i guess it *has to be* in my collection some day! > > Wednesday, May 30th, 2007 - New this year! An actual update and a new acquisition! Yesterday evenning, i felt like updating my site and adding a few missing pictures to my pocket computers collection page. Should have been simple, but Vista made it a little trickier. I still like Vista, though, it is actually the first version of Windows that i happen to actually appreciate since day one. Maybe it has to do with it being pre-installed on a new Dell, so it was up and running right out of the box, yet i find it nicely improved over XP on the UI side, not intrusive as i was afraid it would be, and, for once, it actually gives the impression that the user was now taken into account when designing the interface. Anyway, once i had an editor running, i had less time to play with it and i was much more tired, so i've just added two incomplete pages : the Qualcomm PDQ and the Nokia 9000 communicator. I had not much more planned, though, excepted that i was willing to write descriptions and search for tech specs for each; create one more page for another machine, and update yet another one with screenshots. All of this will come, some day. A few more news about my collection : i'm waiting for a new machine to arrive! Yep, my first acquisition this year! It is an unexpected device i was totally unaware of before finding it in a japanese auction. Nothing spectacular, nothing actually ancient, but a weird japan-only (it seems) device that will be a nice addition to my Sony machines. Feature-wise, it should range somewhere between a PDA and an e-Book. More information soon, hopefully, when i get the parcel! Now, yesterday i was in the mood for updating my site and sharing my collection on the web. Still lasts today, obviously, as i write this entry! I hope the mood with last so that i'll be able to provide regular updates in the coming months! > > Monday, May 21st, 2007 - Robots section, wake up! Ok, it's been roughly a year since i haven't updated my robots part. Anyway, three fun news at once are enough for me to finally update this page : pictured right from top to bottom, meet Nao, the Revoltech Type Zero and the Omnibot 2007 i-Sobot. The NAO is the exciting soon-to-be-released humanoid robot developped by the french start-up company Aldebaran robotics. Thanks to the french robot blog Vie Artificielle ("Artificial life") i've had the opportunity of attending a customer focus-group and see the robot in action for real! Nao is still just a prototype as of today, but it's closing commercial release, and the first production versions should be available to universities and reseach center as soon as next september. The focus group was a great time. In order to reply to several questions regarding the robot's external and "vocal" design, we first had an interesting demonstration, as well as several presentations from some of the team members. After the focus group, a time was dedicated to meet the team and chat freely. Quite interesting, and i've loved the passion that everyone puts into the project. I hope i'll take more time to talk about Nao in the coming months; in the meantime, i'll prepare to save some money to grab one when they'll be released! Much more affordable, the long-waited (by me, at least!) i-Sobot from Tomy Takara (the third one in the picture) seems to be now available in Japan! I've seen it for sale on Amazon Japan and some cheaper ones also on Yahoo Auctions Japan. For about 30000 Yen, one can now grab the "basic" version, but still no new of the higher-end "cam" version which should be released soon after. As it can be guessed, the Cam version should embed a digital camera in it's head, with Wifi capabilities. Then, even much more affordable, last week-end i've bought a small Revoltech model (second one on the picture!) from the Patlabor Type Zero. Hehe, i've been collecting Patlabor Models for a long time now, and gathering a few toys for a few months (seems there are not that much available out there). Now, the Revoltech lineup is a neat set of plastic full-built models, and the Robotech versions look good. So, without replacing my hand-built models (i'll still keep those! ), i like to double them with a set of pre-built toys. It's now done for two of them, maybe i'll also buy a Griffon to complete the set; and i'll check if new versions are released. Oh and to make today's entry complete, i have to mention that, during that very long period without an update, i've had the opportunity of playing with a Robonova robot for a whole week-end! This is also thanks to Vie Artificielle and the french robots store Robopolis. I've taken pictures, shot several videos, and i've started writting a short article about it (only in french for now), and someday, yes, *someday* i'll put my review online! Hi everyone! It's too late for the new year's whishes; but it's been over 3 months since i've last updated my site; and last time was last year. Reasons for not updating the site were numerous... i've been quite busy at work, i've worked on other personnal projects in my scarse free time; and mostly, those last months were very quiet on the collecting front. No new machine, no planned aquisition, and even no actual thrill when the soon-to-become-collectible Apple iPhone was announced. Anyway, just yesterday i've had the opportunity of joining in during the (short) interview of a friend of mine for a french news radio. A journalist is hosting a small "show" (just a weekly 2.5 minutes sequence actually) about collecting; he has already invited over 150 collectors of all kind until now, yesterday was about collecting ancient computers. To record this sequence, he invited the president of MO5.COM, the president of the collector's association i've already mentionned in this page. The sequence was recorded yesterday and will be aired next sunday. So why is the news related to my site? Because I might be next on the list, since "collecting pocket computers" was apparently considered interesting & different enough by the journalist to record a show about it. The journalist was also interested in the fact that there are just a few of us out there officially collecting "pocket" computers and -mostly- expanding their collection's focus to PDAs. I should get back in touch with him next week, and maybe go on with the recording the week after. - at the end of 2006, i've contributed 2 photographs for a book project about the evolution of the PDA market. It seems that the book is now close to finding an editor! - a few months ago, i got an e-mail from a person in South America willing to use a vintage laptop to record data from a GPS module. We both searched for a short while which machine would suit his need better than the Amstrad NC-100 he was starting with at the time. After overcoming several technical problems, he finally announced me yesterday that he succeeded in recording over 3 hours of real time GPS data with the Amstrad! His very own technical skills and former TI engineer work methods are to be thanked for that! I always love it when good ol'vintage machines find a brand new use in our modern world. > > Sunday, November 12th, 2006 - Happy update ^_^ ! The Toshiba IHC-8000 Pasopia Mini, the National JH-600, the Casio OH-7700G, the Sharp PC-1500, the Psion Organiser and the Casio PD-5000 (in no particular order as you can figure). More pictures are waiting to have their pages created, i was expecting to do just that today, and, well, i'm running out of time. I expect the end of the year, and even the first half of next year, as far as i can imagine, to be pretty quiet on the collecting front. Hopefully, i should be able to put the time that i won't spend "collecting" to good use : update my site, for instance. It's been several weeks that i've taken a bunch of pictures from my most recent acquisitions; i still haven't put those online, and that's just the latest example of what should be done. More updates have been waiting for much longer! Yet another update i'm planning would be to open a few pages dedicated to those other pocket devices i own, the ones that i do not list in my "official" collection for various reasons. The story behind this side collection : i've received my first electronic dictionnary years ago as a gift from my family. It was a great credit-card sized device from Seiko, packing words in 4 european languages + 2 japanese sets (both in alphabetic and kana characters forms), and a good usability. This little wonder unfortunately got stolen, so when i could (years after), i've attempted to replace it, but this particular model was not available anymore. My first candidate was a slightly larger, less featured Seiko device; unfortunately it had a weak screen and only lasted a few months before the LCD display became totally unreadable. Bought another one, same problem... so i had to turn to another model. I grabbed a bigger, large screen Casio machine from the internet; great features, 3 languages, but the UI is entirely in Japanese, which makes it very tricky to operate, and i guess i only use at most 20% of it's features. Searching the net for cheap second hand alternate machines, i thought that maybe a smaller, touch-screen device would be easier to operate. Bought one, found it was not. Then i came accross an auction for a weird-looking Canon thingy : it was an electronic Kanji dictionnary (Kanjis are the Chinese characters used in Japanese). It was cheap, i thought it could be useful to me once i would be better in Japanese, so i bought it! 4 devices was enough to start thinking of the set as a side collection... That's when i've noticed two more auctions : one for a Talking electronic dictionnary, and another one for a vintage Sharp electronic dictionnary. The latter was said to be the first electronic dictionnary of japanese design, so, well, you know what happened next (I should also say that it's non working, but buying this one was just for the sake of having it as a "collectible"). As for the Talking dictionnary, i've just received it today, it is also entirely in japanese and i'm unable to make it talk yet... I did not even recognize any japanese writting on the the keyboard that could stand for the speech function! I'll give it another shot, and if i really cannot figure out, then i'll have to ask someone with better japanese skills than mine (not that difficult to find!) if they can help! Anyway, some day, maybe soon maybe not, there will be a page presenting all these machines. I use the US baseline from a well known (and one of my favorite) japanese pocket electronics manufacturers as the title, but today's entry is absolutely not Casio related. I got an unexpected donation yesterday and realized i had to tell a little more about this donator. Here's the story : i am a member of a french computers collectors' association, and i try and give a little of my time to the association when i can. The association is growing more famous here, as, thanks to it's very active president, it is getting more and more present in various fairs and exhibitions. So, well, last week i've learned from the mailing-list that a person was willing to donate a computer to the association, provided someone would come and pick it up; and I did so. Next, i called to see when i could stop at the association's place and bring the machine, but as the association already owns one of these machines, the president offered me to keep it, just making it available to the association's needs whenever necessary. And guess what? The machine turns out to fall right into my collection's focus! So, i'm now the proud owner of an Epson PX-8! It's a little weird, actually, since i had received an HX-20 just a few weeks earlier as my first Epson computer, and next there's it's younger brother also getting to me. Two years separate the release of the HX-20 and of the PX-8, the PX-8 also being on the higher end side. Anyway, the two machines look roughly similar both in shape and positionning, and they are both standing right on the frontier of my collection's interest. Bigger than most pocket computers, they are actually very early laptops, as in "as much power and comfort as possible in a package as small as possible". The PX-8 thus runs CP/M, a professional OS from that era, and offers a Z-80 processor (the 8 bit symbol of the 80's to me), a complete mechanical keyboard, built-in mass storage and a large 80 columns LCD display. Unlike most pockets, and unlike the HX-20, it also has a foldable screen, certainly pionneering what's today the common laptop's form factor when other machines just had one piece casings with integrated screen. Initially, i was planning a small site update this week just to put a few pictures online. Also, I was not planning any new addition to my collection this year. Turns out that today's entry is about an unexpected new machine! It's sometimes better when things don't go the way they should! One more new parcel arrived this morning! I think it should be the last one this year, but who knows?! This parcel came from this USA, brought to you (well, me) with help from Evan, thanks again! So what do we find inside?! One Epson HX-20, one Texas Instrument Compact-Computer 40 (CC-40 for short), one Casio IF-8000 and two Toshiba LC-1038MN MemoNote II. The Epson and TI are large machines. Comparable to the Casio FP-200 in terms of size, features, and market positionning, they represent the most "extreme" evolution of the pocket computers in my collection. Approximately 20 years ago, there was a time when laptop computers did not exist. Pocket computers were best of the breed in computer portability, when the machines that would eventually evolve to our modern day laptops were still dinosaurs the size of a microwave oven (or so! :D ). Aiming at providing more power and usability, some pocket computers have grown to adopt a more comfortable keyboard, seizing the opportunity to use the larger size factor to also embed a motherboard closer to the 8 bit desktops boards of the time. This describes the Epson HX-20 and also roughly describes the TI CC-40, which is actually more on the regular pocket side. It is the first pocket computer from TI, as far as i know. That patent initially covered the idea of storing more than just numeric data in a pocket electronic device (a calculator, at that time). It may seem crazy today, but it appears that the idea was disregarded at first, as most people thought it was just impossible. As we all know it turned out to be actually possible, and a patent was registered. Toshiba got interested in it, and released the MemoNote, the first "calculator" offering memory for alpha-numeric information. Now, the MemoNote II is not the MemoNote I, and, as i said, it's not quite as rare. It's not even actually the first at anything, yet it still features the purest DNA from the world's first "digital directory" patent and it's thus valuable to me! Would it not be for it's lineage, i may have also disregarded the device as well, since it is very dated and by many ways very limited as compared to most other items in my collection. The display, for instance, is LCD bars and not dotmatrix. But looking as a milestone in the PDA evolution, it is quite interesting. Last item in the parcel, an extra IF-8000. I must confess that i already have one, and i'm aware it's against the Classic Computer Collector's Code of Conduct to acquire and store more than one example of an item, yet i'm very fond of the IF-8000 and i was quite scared mine could some day stop working or be damaged. I needed a spare one, i really did! That will be all for today! Still no picture in this entry, and even more to take for the collection pages. I should however be able to work on that in the coming months! Anyway, here's an update, as i've just received a parcel from Japan. More new machines should next arrive from USA, then it should be a calm period for my collection until next year at least. Today's parcel contained : a Toshiba Pasopia mini IHC-8000, and from Casio a PF-3000, a PD-5000E, and a "Dentaning". The Toshiba IHC-8000 is the only Basic pocket computer from Toshiba. It was apparently only released in Japan, and from what i've read in a few internet pages, it might somehow be related to a hanheld/laptop family from Commodore. I'll search for more, and provide the information i can when i open a page for it. PF-3000 is an early data-bank calculator from Casio. It was apparently released after the PF-8000, although it is technically less evolved. I found it at a very decent price, so i had to add it to the collection... If the PF-8000 now appears as an experiment (pionneering a character recognition system based on a tactile area), the PF-3000 is actually the starting point of the whole range of data banks & organisers to come from Casio. Then there's the PD-5000E... this one is a bit mysterious, that's why i've bought it! First, it's not clear to me what "PD" exactly stands for in Casio's lineup. As far as i've understood, Casio has marketted such different devices as portable terminals, programmable systems and organisers/PDA under that brand. This particular machine has a large dotmatrix display, a stylus indicating a sensitive screen, a calculator-type keyboard doubled with a japanese/alphabetic keyboard and several function keys. I assume it is some sort of dedicated-use computer which would run custom programs (out of it's internal memory or cartridges or whatever) that the user cannot modify. I still have to test it, but from what i've understood in the auction, it's "buggy" and does not get passed a startup screen. Might just give credit to my theory : maybe there's no program stored in memory and the machine has nothing to do. The manuals are in Japanese, so i don't know if i'll be able to understand anything (hopefully there will be useful drawings as in most japanese manuals! ), but from my first tests, the user interface is... not that intuitive! And that will be all for today! > > Monday, September 4th, 2006 - Been there, done what? It was a three days wedding that we've attended last week-end. It was then a long week-end. Music was loud, so we all had to talk even louder. Now i'm back, very tired, and i miss my voice so bad... Anyway it seems that it's going better now than just this morning : i'd say my vocal cords are slowly being reconstructed. It should be around 65 to 70% and progressing. The "Series 3" was clearly the first worldwide success from Psion, so true actually that people used to say "a Psion" back then, just like they use to say "a Palm" now. If anybody ever wondered why that "first" machine was name "series THREE" then the answer is, as expected : just because it came after the number I and the number II. Interesting to notice, tho : the I and II were named "Organiser(s)". There was the Psion Organiser; then the Psion Organiser II. At the time, people did not say "a Psion" yet, instead they said "an organiser". Technology evolved, and to release a new, improved machine, people at Psion's decided to drop the dated "organiser" name in favor of the classier "Series". There was indeed a technological leap between the Organiser II and the Series III, but in their time, the I and II were still very interesting devices. So, i'm happy to welcome a "Psion Organiser" (thus it's majesty Psion the First), in my collection, where it will meet with it's younger brother, prince Psion the Third! Just a quick note, until more news machines reach me by the end of september; and i've not updated my collection yet, nor corrected a few mistakes and broken links that i've been mentionned. Should be done someday! There's no such thing as a free lunch, as they say, but to keep the balance there's no such thing as a paid donation either. So, what just arrived today is a great donation from Greece (and, as expected, i'll have to pay for my lunch). But let's talk machines! There were 4 of them in the parcel : the Nokia 9000 communicator which arrived in two flavors (plain old 9000 and upgraded 9000i), a working EO-440 and a non-working Fujitsu PocketPad. As for the Nokia 9000s, i've been after these for a while but for some reason i only ever saw overpriced second hand models for sale. I will have to check more seriously what the mobile world was like when the 9000 was released, but it is definitely one of the earliest smart phones of the internet era (most likely also doubling as the first dual screen clam shell design phone, although it's not quite your regular clamshell...). I already had an EO (non working) and a Pocket Pad (working, poor external condition). And now, i should be able to test a working EO, and also to build a good looking working Pocket Pad out of the two average condition ones. And, well, this will be something new to me, i have never done this kind of thing before. Today, a small parcel has arrived from Germany. Doesn't seem much yet, but the pace will rise in the coming weeks, as this little one is just the first one of a whole battalion of novelties coming to my collection! Inside today's parcel was a Solar Little Professor, from TI. Is it a toy? Is it a calculator? No, it's Superman! Oh, no, wait, sorry, it's just a Toy Calculator. Brought to you by TI came in the late 70's the "Speak & Spell", an educationnal electronic toy embedding TI's speak synthesis technology. The toy was a worldwide success and even made a noticeable appearance in another worldwide success from the 80's : the movie "E.T". Much more obscure, the Little Professor was released approximately at the same time. Also an educationnal electronic toy, but without speach synthesis, it was a calculator with a friendly teacher's face printed on it, and a built-in program that would ask simple math questions and wait for a correct answer. What i've received today is not the original Little Professor, but a solar version that seems to have been released quite recently. For several reasons, i've acquired the machine, then wondered for some time whether it should enter my collection or not. Still wondering, actually... The machine is not programmable, neither does it offer user-available memory. In many ways it's closer to my "other" machines that i plan to present in separate side-collections some day : electronic dictionnaries, for instance. It can also be thought of as a toy, or a game system. So, will it enter the "official" collection, the question remains open. The Little professor is however the first shot of what will become a massive crossfire : after this little parcel, i should get much more from UK, Greece, USA and Japan (in no particular order!). From UK will be coming another small parcel, but the other ones will carry too many machines to count! Although i will get some more "borderline" machines (hear : maybe not to be added to the main collection) from Japan, a total of over 10 machines should get to me within mid-september. Again, this weblog entry misses a picture or two. I definitely have to develop a little something to handle pictures in my log pages. I have to, i have to. Maybe by saying it many many times, i could just have it done automagically? I REALLY have to. I must. (...nothing done yet?? I'll insist until i can prove it works. Then i'll do the same to update my site with the new machines...). > > Thursday, August 3rd, 2006 - Back with no idea for a title! Back at work after a two weeks holiday, two new machines for my collection! Could have been three if had not missed an opportuny to get a Casio Calculator from a garage sale. So, by order of appearance, a Casio OH-7700G calculator and a Qualcomm PDQ have joined my collection! Starting with the latter, the PDQ reached me thanks to Evan. It's in great condition, comes boxed with all accessories and the machine itself might even be new and unused, if i judge by the pastic sheet still protecting the screen. It's been a long time since i wanted to find one for my collection someday, as it's the first smartphone running an industry-standard OS (Palm OS). The OH-7700G is another story. Buying it had more to do with my compulsive collecting side! :D Not quite, though : although it does not represent and actual milestone in the evolution of pocket computing, the OH-7700G it is still an interesting piece due to it's design and intended use. On the electronics and features side, this calculator is exactly the same as the FX-7700G, which is just your regular graphing calculator from Casio. "OH" stands for "OverHead", that's what makes the machine different : it's designed for teachers to present calculator graphics to a classroom using an overhead projector. The machine is thus equiped with a transparent display and a special casing to make it heat resistant. The OH-7700G is far from unique in the Casio OH family, it's not even the first one; but as those devices are rare to find due to their limited release to the educationnal market, i'm still happy i've been able to get this one. Coming up next to my collection : another machine is currently being taken care of by Evan! After this one, no precise plans for now, but i'm vaguely considering buying a couple of other items : crossovers between the pocket computers and game consoles worlds, they would thus "link" those two collections of mine. Also, it could be a good thing if I added more pictures to this very log page. More pictures are also necessary in the collection page of course. Hm well... more work after work? Not exactly what i expect right now as i still struggle to get holidays out of my head during my working day! > > Monday, July 10th, 2006 - More or less one new machine! Thanks to Evan, a Qualcomm PDQ was secured, waiting to officially enter my collection some time soon! The device is mint and comes with all documents, cables, bells and whistles. After the IBM Simon that was the first "smart phone" as we know them now, the PDQ was one of the earliest (if not *the* earliest) device to embed a standard PDA (running PalmOS) into a cellphone. The PDQ is also way smaller than the Simon, but as soon as it was released, did get the nickname "the Brick" nevertheless, as it still exceeded those day's size standards. It was also quite pricey when it was released, but it opened the way to our Treos and basically every regular sized "smart phone" around. Just in time for holidays, i also received a new digital camera today. This is not computer or PDA related (although at least one digital camera deserves a place of choice in mine collection), but in the parcel was a nice little pocket device too! The machine, a Canon CA-2000, will not be presented in my collection, but i might just open another "side collection" for digital dictionnaries, and it would be in it! Learning Japanese, i've acquired a few digital dictionnaries, and i now own 5 of them, all with different features. The CA-2000 is quite uncommon : it's a "kanji dictionnary". Kanjis are chinese characters, lots of them are also used in Japanese. As the japanese writing also uses special "alphabets", most words in japanese have two "writings" : japanese or chinese. The CA-2000 will display the kanji(s) matching on a japanese (kana) writing. It includes a japanese "kana" keyboard and a graphic display for those nice chinese characters. Pretty neat machine, but as with most of my dictionnaries, it's a little awkward to use, given that all function keys are labelled in japanese. Some day, however, i'll master the use of it as i'll master the japanese language ^_^ Oh yes, some day i will! The following weeks should bring several updates to my robots site : either covering "robot events" from my own personal life (more to come just below, stay tuned! ); pointing to information & data sources on the web; discussing several topics i've been keeping in mind for long, or even (hopefully!) adding new content to the page. As for robots events : i've recently received a couple of mechanized virtual pets, which i'll present while discussing the question "are these robot?". Another exciting event is due next week-end : i should be able to test a Robonova 30cm tall humanoid robot during 2 days!! I'm really looking forward to it, and i hope i'll have enough time to post a proper, well documented review here. Data sources and information : a robot museum will open in Japan, i've just read about this and i'll look for more information. 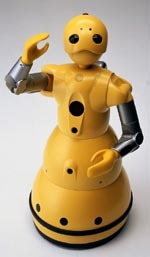 I've also discovered a robot i did not know, from the japanese company Brother : the Brother ifbot. I hope i'll be able to make at least some of these updates before i leave for a 2 weeks holiday on July 15th. If not, well, see you in August! Filling the gap between my real life collection and it's online counterpart, i've just added 5 more pages : Casio PB-1000C, Fujitsu PoqetPad, Sony PTC-500 and the RIM Inter@ctive 2 way pager and RIM 950 Blackberry. Granted, all pages in the site are not complete with tech details and description, but at least more and more machines are now available! 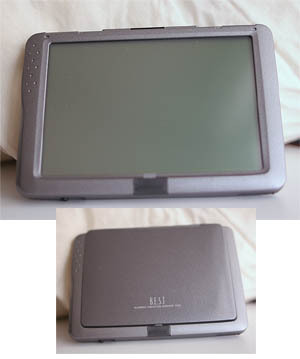 I've also updated the Fossil Wrist PDA page with information i've received from Oliver W. Leibenguth, from Compuseum. His online collection is worth visiting and should be updated soon (? ;) ) with many news, as far as i can judge from his blog. As for my collection, i've just received a Sharp PC-1500! This BASIC pocket computer is the first Sharp pocket computer i get. I've been totally unfair to Sharp until today, as they've invented the first BASIC pocket computer and i did not have any of their earliest machines until now... Although the PC-1500 is not their first pocket computer, it was a huge hit and an interesting milestone in their lineup. > > Friday, june 9th, 2006 : building my own arcade! 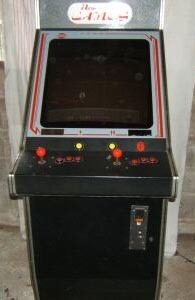 It's the one pictured right, it has a rotating screen to play both horizontal and vertical games, and it was sold with two boards! I still have to find a way to take it from the seller's place, and i will actually not be able to host it at home; but i've found a home for it; where it will be treated well until i'm able to host it! A few more arcade news : i've update my collection page with Flying Shark (bootleg) that i've recently bought, Legendary Wings, that was not listed for some reason (can't remember when i've bought it), and V-Five! I'm also very happy to have found an original Outzone board (set2). I was thinking or selling my bootleg set 1 after i got the new board, but at second thought, the two make an interesting set as i have both existing versions. The long waited parcel from Japan has arrived today! I say "long waited" but i have in fact requested shipping just last sunday; so it was quite fast to get here. But the items in there were available for quite some time until i finally decided to have them shipped to me. Anyway, so here's a family picture of the parcel's content! What have we got here? 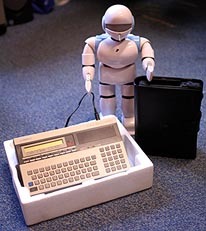 On the left, a Panasonic JH-600, on the right in the nice filofax casing, a Sony PTC-500, and in the middle, presentiheng the other two, a Pino toy robot. The Panasonic JH-600 is quite unique and, as a world premiere in my collection, it's not electrically autonomous. As i've discovered when opening the box, the AC cord is firmly attached to the body, and there's no battery space in the unit. All this means it has to be plugged to run; which is the only machine to run this way in the whole history of my collection! Feature-wise, i did not exactly know what it was capable of before having it in my hands; would it be a BASIC computer, a more simple data bank, i couldn't say. The only thing i knew, and that's what makes it unique, is that is it based on voice recognition and speech synthesis!! Opening the box, i've discovered it was a calculator, data bank and terminal, with voice control for all the features. I still have to test it, and i probably never will be able to as it certainly only "understands" japanese, but i'm still very happy i found this little guy! The PTC-500 is not actual news to me, i already had the occasion of buying some on behalf of other persons. I just did not have my own one, so as i've come across an interesting sale, got mine as i had a chance! PTC stands for "PalmTop Computer", as written on the casing (i've read several references mentionned "PorTable Computer" instead, don't know which one is correct); the PTC-500 is apparently Sony's very first handheld device. Then there's the Pino! As you can easily guess from the picture, this is definitely not a handheld computer! I consider it a toy until i've be able to test it's skills, but depending on what it is capable of, it might qualify to the "robot" status and join my robots collection. 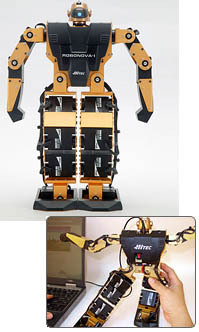 "Pino" was initially a japanese project aiming at developping an "open source" humanoid robot platform. Several toys were created, based on the Pino figure, and the one you see here is the latest and the most advanced of those derived product. It seems to do quite well as an autonomous humanoid machine, yet i still have to see it walk (if it is able to!) and see how it interacts with it's "users" to decide if i see it as a robot or not. Now for the other news! First of all, i've updated the collection pages. The Sharp EL 9000 page, the Seiko Ruputer page and the Fossil PalmOS WristPDA page are now online with pictures. Last but not least for today : a great resource for computer collectors has recently changed name, shape and everything! The Computer Collector Newsletter, formerly a monthly e-mail newsletter, is now available as a weblog by the cool name of Technology Rewind (i like the steampunk feel!). > > Tuesday, May 30th, 2006 - Help yourself and Heaven will help you! What's fascinating (captain) is that, as i've said earlier, i have decided to buy "just a few more machines" a few weeks ago, and just as i've won a couple of auctions, i got the news of unexpected donations for my collection. Today's news : two new additions to my collection, courtesy of Research In Motion, and i'm very happy to have these. I must confess that, during what i call the "WindowsCE and Mobile phones" era, i was not as much interested in what was going on as before. Shame on me, as i've missed a few interesting things, like what was going on in America and more precisely in Canada. "Blackberry" is today a well known product. The brand stands for "push mail", so that competition products either turn to RIM/Blackberry to licence the blackberry features or (and i only think of microsoft here) have to come up with a new wanabee standard. Well, there had to be a starting point, and what i've received today is not one, but two starting points : the earliest two-way "pager" device from RIM (most likely the first of it's kind for western cellular networks, maybe even in the world?) and the very first product of the now popular blackberry line. I still have to test these, and of course present them in their new pages, but i have already updated my collection page to add them to the list. As i was at it, I have also updated a few pages with pictures and added new pages (Casio WQV-10, NEC PC-2001, Casio PF-8000, Casio FX-603p to name some i remember). Now, i should get yet another parcel before July, with 2 new devices for the pocket computers collection, and a possible recruit for my robot collection. I'm looking forward to test it, see if it qualifies! If it does, then expect an update to my robots pages soon! > > Monday, May 8th, 2006 - Rise from your grave! Anyway, if one could have thought i'd have stopped all activity on the collection and site fronts, the past week proves them wrong. A few weeks ago, i've won an auction for what seems to be a neat little computer from Japan. As i'm waiting for it to get to France (i still have to request shipment, yet i wait for a couple more things before i do), i've received a surprise donation from Niclas Nielsen (Thank you so much for this donation, and for your help!) with 3 new machines in the parcel! In Niclas' parcel were a Fujitsu PoqetPad Plus, an Acorn Pocket Book II, and a Sharp IQ-7000. The two other machines in the parcel were totally unknown to me, and interesting too. Dedicated pages with more details will come. Yeah, some day, they definitely will! So this means more news in the coming weeks/months, depending on the time i'll have for updating. There are still a number of machines waiting for their page, pictures or descriptive contents. I'm in the process of progressively updating the missing parts. > > Thursday, April 27th, 2006 - No, my site is not dead! Anyways... I'm still there! And my pocket devices collection is not abandonned. Today i've added a few contents to the site : short description for 4 machines, the Casio PF-8000, Casio CQ-1, Casio FX-603P, and FX-190. Yeah, just Casios! Another news on the pocket systems part is that i may receive new, interesting devices soon! I won't tell more right now, but i'm quite excited about some of them. Stay tuned for more news by May! > >Monday, January 9th 2006 : Happy new year!! This is indeed my first post of the year! So it's the time to wish everyone reading this (i know you're there!) a great year! Back to the forecast after the news! On the robots front, the past weeks have seen the announcement of a new version of the Honda Asimo robot, and the delivery of the first commercially available "humanoid" robot to the few lucky ones that pre-ordered it. The Mitsubishi Wakamaru was announced for commercial release in Japan a few months ago, and was delivered as expected to the first bunch of 100 customers (i should check my sources but this should be accurate!). It's not actually humanoid, as it's running on wheels instead of legs, yet it's designed for home use, has a pair of arms, a head, and a "personnality" that make it the first 21st century domestic fantasy-come-true in robotics. Er, i'm aware the news here is pretty much pointless as i provide no link... but i mostly wanted to mention, and i could enhance the contents soon. On the pocket computers front, PC-World has put up a few pages dedicated to the "The 50 Greatest Gadgets of the Past 50 Years". This interesting study is available there. Apart from being very interesting in itself, i also mention this as they list the IBM Simon in the top 50 items of the past 50 years, and they link to my Simon page for details. Worth returning the gesture, as they've requested authorisation before linking. Great work they've done, too! We're back to my 2006 forecast : among a whole lot of things i'd like to do in my site, i'd love to work on my "computers" part a little more. Maybe also open a larger part in french. I tend to think that the time i'd spend on my website would be working on a photography site, however... future will tell! As of just now, i mostly have to financially recover from a photographic equipment buying craze, and wait (and work!) the time it will take to convince myself my pictures are worth presenting (or not!). Ok, well, this title is very clich�; and i don't even have "so many things" to talk about. However, talking about those few things happens late due to many *other* things keeping me busy until now. Point is, i've received yet another parcel from Japan last monday; with stuff for everyone. For two of my collections, that is : robots (of the toy breed) and pocket computers. On the computers front : secured a Nec PC-2001 pocket computer and a Casio CQ-1 calculator. The PC 2001 is nothing spectacular, i guess, but it's the first NEC machine in my collection. I do like NEC for having released a gaming system that was a huge hit in Japan in the 80's and early 90's (although nobody else wanted to release that product, that was initially developped by another company); and for having "pionneered" the color handheld gaming systems (Atari released a similar product at the approximate same time, but the NEC system was a handheld version of their already popular home system, which was both clever and technically brilliant). The CQ-1 has a better place in handheld history, as being the first multi-featured calculator running off batteries (thus handheld, as opposed to earlier system that required a wall plug to run). This means it's a valuable step in the way to portable computers as we know them today. We're talking 1976, and the machine's casing has a very typical design that makes it worth having just for it! More information on the CQ-1 can be found on Evan's PDA History page. Now, to the robots front! I've received in the parcel a Patlabor toy, quite big, quite cheap-looking, but cool nonetheless. As i was at it, i also got a few japanese books about the Patlabor series, where i've found lots of visual information on the series' mecha design. There's actually more news on the robots front, as i've received a Robodog for my birthday two weeks ago! The robodog is, most obviously, Robosapien's robotic pet. Just before i've received the present, i had seen a roboraptor (a dinosaur-pet from the same family) for sale in a second-hand store, found it funny to actually see one there for the first time, and even wondered if i should get it. A couple hours later, a brand new robodog was mine! At least once every year, i firmly decide that my pocket computers collection is now as complete as i could have expected, and i could stop getting new items. Most of the times, the decision lasts just a few months until i come across that very rare item i thought i'd never find, or i find any other reason to dive into collecting again. Last month, it seemed that coming back from holidays put me back in the collecting mood! At the exact same time, i came across a Sharp EL-9000 auction... I've mentionned earlier in my site that i had once missed an EL-9000 from a store in Paris, and that i blamed myself for that since then. Well now, it's corrected, i didn't miss the second one i had a chance to get! The Sharp EL-9000 is apparently the first graphing calculator from Sharp. Contemporary to the Casio Fx-7000G, it features a smaller screen, and a foldable "wallet" casing. But my collecting mood didn't vanish bidding on that auction. As i was at it, i also bid on a Casio FX-603P auction! I already own a Fx-602P, which is the first alpha-numeric programmable from Casio, and was very ahead of it's time. It seems that Casio was aware that the 602 has it's fan even today, because they recently (think 90's, although i don't know the exact release year yet) released an updated version : the Fx-603p, which is quite different from other Casio models software wise, and feature a 602-like programming language instead. I'm very happy i found one, as it was apparenly not distributed outside Japan as far as i know. I'll have to test the FX-603p to see how different it is from it's parent calculator, but what i can say for now is that, except for the black casing, one major difference stands in the 2 lines display (the 602 just had 1 line). There's also more memory, certainly. So one could think my hunger would have calmed down at that point, but, waiting for the EL-9000 and FX-603P to get to my japanese auction deputy company's warehouse, i saw another interesting auction, this time for a Casio PF-8000! This little device is one of the earliest experiment from Casio in "handwritting" recognition. It might even be the first consumer system to include character recognition. The design is interesting, as there's no graphic screen in the machine, so the character recognition works by drawing characters on a sensitive area that doubles as the calculator keyboard. I'll make it clearer when i review the machine. Until then (and even after, for that matter), more information and a picture can be found in Evan Koblentz' History of the PDA as well as several other pages. Sidenote : although pretty unknown, the PF-8000 is one of the few vintage machines for which Google finds a whole set of accurate images. Not all machines are treated that well... See the Kyocera Refalo, for instance : seems that my own site lures Google into thinking not only the Refalo is a Refalo. > >Monday, october 17th 2005 : Invasion of the robots from...France? I've recently learned about a soon-to-come small-sized home humanoid robot. Interesting news is that it's developped by a french company! According to Bruno Maisonnier, creator of Aldebaran Robotics, which develops the robot with the ENSTA, a french school of advanced technologies, we are now living a turn in robots history, the robots market is now very similar to what the micro-computers market was at the beginning. Aldebaran's robot will be the one for this new era. The news, dated 15 september, is available, in french, here and here. I do share Bruno Maisonnier's point of view. Give the market a few more years, and robots-geeks playing with home domestic robots will be a reality just like computer-geeks were in the 80s. A few more years is just what the little french robot needs to actually come to the market : even if a prototype should be presented before the end of this year, the robot should not go on sale until late 2007. This page (in french) states that, as of march 2005, the release was due "next summer". Obvously, it was not released last summer, and as the news has it, that should not be summer 2006 nor 2007 either. Anyway i'm looking forward to it... First, i'd like to know what the little guy looks like, what it will be up to, and mostly, how much it will cost. As for what it will capable of : quoting Bruno Maisonnier it will be able to move around (walking, i assume), stand up, imitate human gestures. It will also be able to talk and it will have a certain level of speech recognition. Then it will also have a basic sense of vision, which will be upgradable (the article doesn't make it clear whether the upgrade would be hardware, software, or both). One of the major features will also be the open development interface, URBI for "Universal Robotic Body Interface". This environment aims at gathering a large community of developpers, as it is open to a large number of programming languages, and it's already being used in several research projects and among a few robots enthusiasts. So, which competition the little guy will face? One could think of the Robosapien, as a domestic companion in the first place. Of course, there's a long way to go for the Robosapien to be capable of what the french project will be capable of. But the Robosapien V2 should show up very soon, it is both more humanoid than before and also more "intelligent". Noone can say yet what the 2007 version will be capable of, but progress will definitely be made until then. Then there's the Nuvo robot, from ZMP. Targetted for home use, this "humanoid" robot already has vision and evolved software. It is not quite humanoid yet, though, as it's "arms" are very primitive, and it is not stated as easily hackable either. There again, ZMP's plans for 2007 are unknown. It is thus quite safe, for now, to leave the question open about which will be Aldebaran's robots competitors in 2007. Most of those above have the potential, provided they evolve until then (and why wouldn't they?! ), and other companies are working on robot projects that could come to the market within the next 2 years. Anyway, before next January, we should know more about this project. As i've said, i'm really looking forward to it. I've just read two announces from Nintendo (yesterday) and Sony (today) that they were both going to open free wireless accesspoint in Japan for their respective handheld game consoles. Nintendo's philosophy will be to distribute USB dongles that will turn any PC into a wireless router for the DS, and they will of course promote this technology among game resellers and related businesses in order to rapidly build a large community of public access points. What Sony will do is yet unclear to me, but the goal is the same : provide PSP owners with a grid of free access points to enhance the PSP gaming experience. As things should go, those access points should be just regular internet access points, only dedicated to specific machines. It's already known that the PSP comes with a built-in internet browser (with it's latest firmware version), so, on top of free network gaming, we're actually talking free mobile internet access here. The PSP is also known for hosting a quite decent homebrew dev community. Is it just me, or would it be expectable to see Skype-like software appear someday? Skype is already available to a number of PDA users, yet the handheld gaming market targets a wider audience. It would be very interesting if wireless handheld gaming functions turned out to be actually usable (and used!) as a free mobile phone network. Not only would it bring free VoIP to a large audience, but, breaking the rules of regular national cellphone network carriers, it would actually benefit the "global village". Sorry no link to the news yet, but i'll edit this entry to add some soon. Just came across yet another DIY robot kit from Japan i had never heard of : the Robonova-I from japanese manufacturer Hitec. The announced price is 98000 YEN and as a matter of fact, the robot is/will be already available in Europe for 869 EUROs from this site. The same site will also offer a "ready to walk" version, which is still open-priced yet. From what i've read, the kit comes with an IR interface for PC communication, and with a dev kit including several programming tools, among which is a dedicated Basic language. Sounds promising! As it can be seen on the picture, the kit is quite small. It's obviously targetted to compete Kondo and V-Stone kits, for a more affordable price. The kit includes 16 servos and an expandable computer board. Robonova official page (in Japanese). As i'm talking about "toy" robots, here's slightly older news from Korea : the Transbot robot is a cool little transformable RC robot toy from Yujin Robotics. Using the remote controller, the robot can be operated to walk in all directions (forward, reverse, sideways, turn) and transform into a RC car! Battle functions are also included to compete against another Transbot. Pictures and videos are available from the official page linked above. 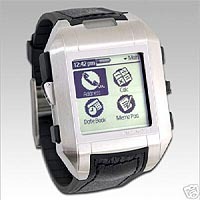 > > Wednesday, september 28th 2005 : PalmOS on your wrist = WristOS? This morning, I've received a Fossil Palm OS wrist-PDA. This little machine, that was once vapor-ware for over 2 years, has finally been discontinued by the manufacturer less than a year after it's official release. I've grabbed one as they are still quite common and sale at affordable prices on eBay and Amazon (although Amazon won't ship outside the USA). Ever since i've first heard of that Palm-OS powered watch (which brings us back to 2002 or so), i've been thinking it would be a very nice addition to my collection. Now it is! Several models of the watch were available, with various cases and bracelet. The metal version was the most expensive when the watch was still available, and it is still the rarest. I got a resin version, which will do pretty fine for what it's intended! Before the Palm-OS powered Fossil watch, there had been generations of "regular" data bank watches running dedicated firmwares (like the Casio VDB-1000 here -and also there-). Some even pionneered touch-screen on a watch (Epson RC-20). I would call this breed the "bottom up" line, where technological evolution was about adding more and more power to a watch. The Fossil watch is from another breed i call "top down", where evolution leads to shrinking "standard" PDA power and software to the size of a watch. Another watch from that breed is the Seiko Ruputer, AKA OnHand PC outside Japan. Both are/were available on the market, but there's a third family of "top down" products that did not actually breed outside IBM research laboratories yet : the Linux watches, one of which is developped with watch maker Citizen. I wanted to talk about non-japanese robots projects a little more, well a chinese robot project was presented just in time to help me do so. The "Huitong" humanoid robot (right) was demonstrated doing chinese "sword dance" : Taijiquan. I've found no video of the machine, but pictures of it in action can be seen on this page at Chinanews. Huitong is 1.6 meters tall, weights 63 Kg and has 32 degrees of freedom; it is able to walk, dance, walk up and down stairs, and more generally "imitate complex human gestures". This "imitating" thing and the fact that it was demonstrated doing traditionnal chinese dance strongly reminds me of the Promet Robot that was once demonstrated doing traditionnal japanese dance. The robot was dancing a recorded choregraphy aside a human dancer, which gave the feeling that the robot was actually following the dancer's moves in real time. More information, pictures and videos can be found in this page at Plyojump, one of the greatest humanoid robots sites out there. Just as i had written a few lines about commercially available robots 5 days ago, Fujitsu announces that they are taking orders for the ENON robot. The robot, which rolls on wheels but has a more humanoid upper part, is an evolution of an earlier platform. Fujitsu had announced as early as september 04 that the platform would be commercially available in 2005, well one year later, it actually is, in a slightly refined shape. This is one more page i should update in my site, as i did not even mention that earlier version back then. 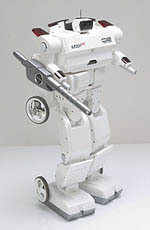 ENON is quite reminiscent of the Mitsubishi Wakamaru, that Mitsubishi also put on sale a few days ago : a robot on wheel, with 2 arms, a head and communication abilities. The ENON also has a focus on transporting object, as a dedicated compartment in it's torso allows for transporting up to 10kg objects that the robot will be able to deliver to an indicated location. Even if ENON hits the market at the same time as Wakamaru and bears many a resemblance with it, it comes at the much higher pricetag of $54,000 (as compared to $14000 for the Wakamaru...). ENON is actually aimed at the corporate market rather than the domestic market (Wakamaru was presented as a house-sitting robot and personal assistant), and as stated in Fujitsu's page, the voice recognition only works in Japanese. Well the news was widely conveyed by the major news sites on August 22, but obviously, i was more interested in my soon-to-come holidays at the time, so i missed it back then. So Square-Enix, born from the merging or Square and Enix (would could have thought?! ), two major RPG editors, is ranked 2nd biggest japanese videogames maker in this news from Reuters, and it's the perfect example of how domestic game systems took over the video game market. It is now planning to absorb Taito, once a giant in arcade video games, and creator of such video games myths as Space Invaders, Bubble Bobble and Puzzle Bobble. In the same Reuters article, i've also learned that one of Taito major shareholders (36.02%) was Kyocera, an electronics and semi-conductors company that also made several attempts in the pocket computers business. As the buying operation takes place on the stock exchange market, Squre-Enix has announced it would dropped the plan if it failed to buy at least 67% of Taito's shares. Square Enix is thus acquiring it's entry ticket to the world of arcade, slot machines and "amusement parks*". Square already approached the arcade world in the 90's actually, as they developped the Ehrgeiz fighting game, that was distributed by Namco. Namco, by the way, is now property of Bandai, as i've also learned in the Reuters news. * As most major arcade editors, Taito owns several amusement centers in Japan. Not exactly amusement parks indeed, some are mostly giant themed arcades as far as i know, but considering that Square-Enix is famous for the very rich fantasy universes they create, and that they already tried to market their trademark universe into other medias, like in the Final Fantasy movie, it would not be that surprising to see the new Square-Enix-Taito entity develop the Square-Enix catalog in other markets that Taito already knows. Also, Square-Enix already teamed-up with Disney to create a video-game series using Disney licences, which as see as another clue that Square-Enix is willing to capitalize on well-known characters and universes. A few weeks ago, Mitsubishi announced that their Wakamaru robot would go on sale within the end of this month. Now, that's where i realize i've never mentionned Wakamaru in this site before, not even planned a dedicated page for it yet. That's mostly because i did not think of it as a "humanoid" robot in the first place because it lacks legs. As my site's focus has evolved and also includes not-so-humanoids robots, i definitely should put more information about Wakamaru online some day. So well, the little yellow buddy (picture : top one on the right) will go on sale, or at least 100 units of it as announced by Mitsubishi, for the price of US$14,300 each. For this price, you'll get a robot that is able to recognize up to 10 people based on face recognition, knows 10 000 words, performs house-sitting, baby-sitting and secretary tasks, and mostly, will look cool in any geek interior. More news about humanoids robots going on sale come from Kawada industries. I've set up a simple and very incomplete page about their earliest and impressive HRP-2 "Promet" here, well now the HRP-3 (second one on the right) is announced for the industrial market in 2006. The machine is designed to work even under a heavy rain, walk on slippy surfaces, and can be either remote-controlled or programmed. 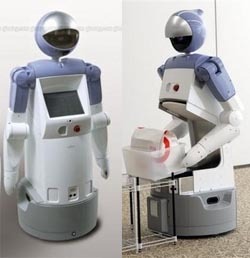 The HRP-3 is not the first robot to go on sale to corporate buyers : the Fujitsu HOAP robots were available as robotic research platforms for a few years, and Honda Asimo was available rental. What makes the HRP-3 different is that it seems clearly marketted to handle actual work in industrial environments. I will be very curious to see who will be the first buyers and what they'll do with the robots (other than corporate image refining campaigns, that is). More on the toyish side : Volks, a japanese manufacturer that is famous for it's very detailled (and quite expensive) action figures and resin characters kits; has announced the Robofie VS-1 kit (pictured left). For approximately 1300 EUROs, once fully built (comes as a DIY kit), this small remote-controlled buddy (approx 40 cm high) will be able to walk, run, climb stairs and execute several movements. A video is available in this page. Looks cool and all, but among the specs i've noticed "magnetic soles"... pretty reminiscent of some of the Robo Garage robots such as the Kyosho Gunwalker (there's a picture of it all the way down my robots toys collection page). The Gunwalker will only walk on metallic magnetic surfaces, and as far as i can see, so will the Robofie. That's a bit disappointing, since the robot is announced for a price of approximately USD 1300. For just a little more money, i'd rather go with a Kondo or V-Stone kit robot that will walk on any flat surface (see July 24th update below). As i hope i'll be able to update my site more regularly with my new, hand-crafted publishing tool, i'm already planning new entries in the robots section. First i think i'll open to non-japanese robot projects a little more. Coming-up next : spherical robots, then exoskeletons. Both topics will present non-japanese research projects. I'll also gather information about non-japanese humanoid robots for future entries. > > Tuesday, August 30th 2005 : weblog app ready! It's been a long time since i've updated my site. One of the reasons was that i was building a small PHP tool to handle all HTML updating. There are many tools out there that i could have used to enable instant weblog features in my site, but i did want something very specific. Mostly, i didn't want to use a database, and i also wanted to keep my HTML pages and not spend time adapting my pages to a templating tool needs. The first version of this small app is now ready, so hopefully i should be able to update my site more often. Using this application, i'll also gather all the updates from my different sections in my home page. There's still lots to do on the PHP application, though. As of today, the main application is able to create new entries and edit existing entries. I've also developped basis for an online links manager, aiming both at gathering my bookmarks all in a single, online space, and at generating links pages automatically. Anyway, should this entry publish alright on the different topics i'll send it to, then it would be a great first step! [Edit] Well, turned out that there was some fixing needed. Work is done, beta testing is done, so now i think i have something stable enough! I'll focus on updating AND continue improving this application when i'm back from holidays.